Social media continues to evolve and ways to improve engagement are also changing constantly. There are always ways to tweak, change and alter social media to improve engagement levels and make a little more of your efforts. Use your Google+ business account to create Google+ Circles, which others will be delighted to join. The ability to share circles is something that can be utilised here and can be a great resource for those looking for industry news, views or advice. By doing so you are building an audience and many connected in the same circle will want to connect with you. Google+ Communities can also be a great addition and becoming increasingly active can benefit your business significantly. If there’s a very active company in your business area then join it and if not, why not create one? LinkedIn Company pages can allow three groups on their page. The aim of this is to encourage more people to join. Participating in these will help you to discuss industry news and also answer and ask questions. It’s another great way to participate, increase visibility and also to interact with those interested in your area of work. Not all pins have to be company pins and you can collaborate and create a more personal feel by getting others to pin on your boards. Inviting other Pinterest lovers to pin on a specific board is easy to do and also very helpful. You can add people with the ‘who can pin’ option in the edit area. Invited people can then accept and pin to the board. However, you will also have control over pins, can remove pins and the user can’t change names or descriptions. Foursquare allows users to offer tips to other users on a location. Leaving tips at a location near your business or for your business can be a great way to build up authority in an area on Foursquare. It can also create a more personable feel around your business and you’ll be participating in your community too and so are seen by more people. Increasing the amount of engagement via Instagram is also a great way to feature more on social media. Why not ask your followers to send in photos and then use featured photos on your own account with attribution to the individuals? Just ask them to add a specific hashtag so you can spot their attempts. This sort of engagement adds to the community and gives people a sense of inclusion and engagement. The easiest way to feature other people’s photos is to use a third party app like Webstagram – it allows users to repost underneath photos. Just ask the owner for permission to post it first. These five alternative tips should help you increase engagement in some creative ways and benefit more from social media. Need help with your social media marketing strategy? 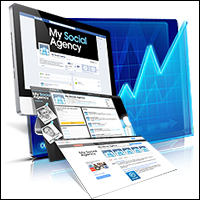 Get in touch to learn more about MySocialAgency.